How did this historian and sign painter from up the pike find his way up the river? 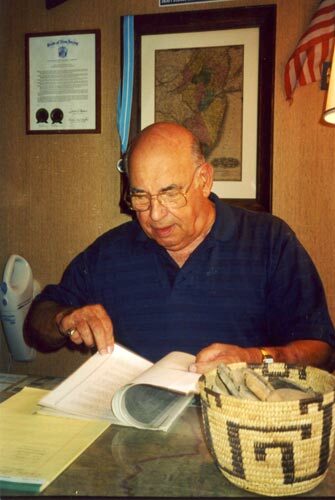 William Leap, of Runnemede, is the author of a comprehensive history of Runnemede, Gloucester County, NJ. His research interests led him to other parts of the state. He was once given the key to Atlantic City for his efforts to help raise awareness of the historical significance of that world-renown resort. But it was Leap's interest in industrial history that brought him to the Maurice River in the mid-1950's. As Leap began his research foray into his newly discovered slice of southern NJ, he struck up a friendship with Herschel Schenck, of Millville. Schenck was also, coincidentally, a sign painter and a historian who was very interested in the Native Americans that lived in the southern reaches of New Jersey. Leap took an instant liking to the Down Jersey area. He decided to look for property in the area. He enlisted his new friend Schenck to keep his eye open for available houses near Union Lake or along the upper reaches of the Maurice River in Commercial Township. Ideally, Leap was looking for a little house in the woods, with some acreage and plenty of solitude. Schenck was doing some lettering on a truck for the Weatherby's when he remembered the log cabin he discovered while searching the river banks one day for Indian artifacts. 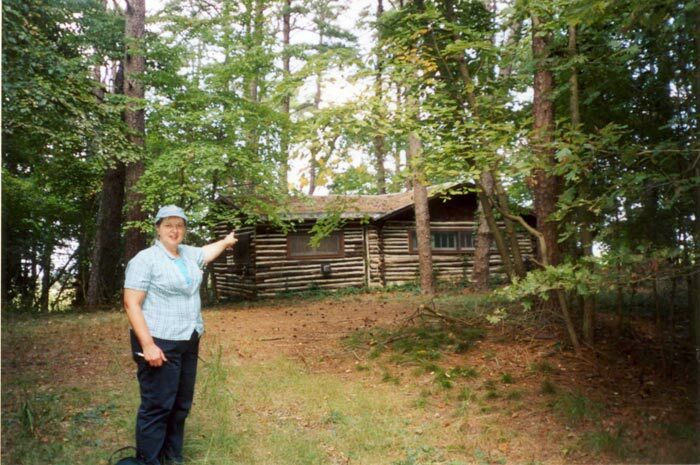 The cabin was just off of the tract that the Weatherby's cultivated. It sat up near the the bluffs and the point that jutted out into the Maurice River. That piece of property was owned by George Pettinos. The cabin was built in 1942 for Holly Sayers, who was then manager for the Pettinos sand mining operation that excavated the banks along that part of the Maurice River. Sayers used the cabin for awhile. When he moved out, a restaurant owner from south Vineland used the cabin for a few years. By the time Leap learned about it, it was unoccupied. Leap got in touch with Pettinos and offered to buy the log cabin. The cabin was for sale - but not the land, Leap related. But Leap was not interested in relocating the cabin. It was the land that attracted him. He was able to work out a deal with Pettinos to lease the cabin and the stretch of land that rose dramatically above the Maurice River. Leap and wife Clare (who is now deceased) were delighted with their cabin - and so was their son Ken. It was the family's summer place. "Ken grew up down there," Leap said. Ken, who was named John Kenneth Leap, goes by J. Kenneth Leap. He is a stained glass window artist and is currently in residence at Wheaton Village. He is a well-respected craftsman whose work is in demand. Leap recalled how, as a youngster, Ken would stretch out on the floor of the tiny screened-in porch "just watching those big pine trees, just moving in the wind. It just fascinated him. I think that's where he got his love for nature," Leap said, adding that today Ken's artwork draws from the natural themes that he grew up with. Leap remembered how worn the little cabin was when he first saw it. The floor was rotted out. But the walls were still in good shape. "Those were good cedar logs," he said. The cabin was a summer space. There was no electricity, no phone or heat. It did have a water pump - and a river full of water. He laughed. "We had the biggest bathtub in South Jersey. We air-dried! By the time we got up the hill and into the house ahead of the mosquitoes we were dry." The Leap family spent warm weather days at the cabin - and as many weekends as they could. They had a canoe, and later bought a power boat. They decided that a fireplace would make things cozy on those chillier days. "The farmers told me about Gerry Moore," Leap said. Moore, a mason, agreed to build a fireplace in the cabin. Leap said that they struck up a bond of friendship the very first time the Moore's, Gerry and Ann, came over to the cabin. Ann, a science teacher at Millville High School, shared Clare Leap's love of nature. Gerry, like Bill, was very interested in the history of the area. Once Leap put a phone in the cabin, it wasn't long before the two couples were making arrangements to get together. Leap said that one of his best memories was when the Moore's called to invite their new friends over for "a mess of peas." The Moore's planted peas in their garden plot. Leap said that in early June, Gerry would harvest heaps of the green gems and cook them up. Served in a big bowl with milk and butter, it was quite a satisfying meal, Leap said. This little spot on the earth intrigued the Leap family. They enjoyed living above the river, surrounded by the native plants and wildlife. Even the owls that called from the treetops in the night added to the exotic seclusion of the bluffs. 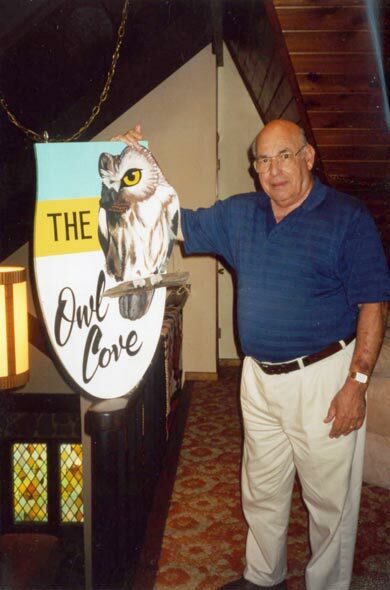 The owls are what inspired the family to name their summer home. It wasn't long before Leap, a sign-painter by trade, created a marker designating this curved shoreline of the Maurice River as Owl's Cove. That was in the 1960's. The rustic cabin has been demolished to make way for a public-use wilderness area. The sign is long gone, too. But many still know that stretch of the Maurice River as Owl's Cove. During his years on the property, Leap was puzzled by one mystery that he still hasn't been able to solve. At low tide, he would walk down along the shoreline below their cabin. In the wet sands, he would often find shards and fragments of Native American pottery. Many of the pieces had been decorated with etched patterns. During those years at the cabin, Leap found thousands of pieces of these clay vessels. He didn't know where they were washing in from. And he was never able to fit pieces together to make even one container. For eight years, from 1962 to 1970, the Leaps came to the cabin. Bill became somewhat of an expert on the natural features there on the bluffs of the Maurice River. Wanting to share some of that beauty, Leap has given slide presentations to organizations who wanted to know what was "Down on the Wahaquenack. "* Leap opens his presentation with the explanation that Wahaquenack was the Native American name for what is today called the Maurice River. Place names like Owl's Cove often fade into the past, obliterated by new perspectives and experiences. Historians like Leap spend a lifetime cultivating their own passions, hoping that someone will be interested enough to learn from them so that they can pass these treasures along.